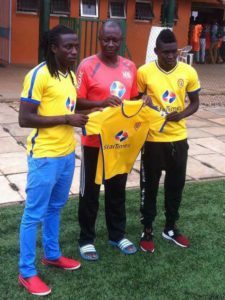 Allan Katerega(left) and Muhammed Shaban(right) with KCCA FC coach Mike Mutebi at their unveiling today. Photo by Shaban Lubega. FOOTBALL–After weeks of endless speculation, KCCA FC have finally signed Muhammed Shaban on a three-year deal from Onduparaka. Shaban came out officially on September 9 and assured the football fraternity of his unconditional love for the Kasasiro boys through a face book post. He becomes KCCA’s 13th signing of the off season with them trying to win the league for the third successive season. “We are happy that Shaban is finally joining us,” said KCCA FC head coach Mike Mutebi. “He personally asked me last year to let him join us but I declined because I thought he was still a season away from being our player,” Mutebi added. “He comes with a not so good disciplinary record but you can trust that i will tame him in all aspects,” he said. Shaban had absconded from training with former side Onduparaka since they resumed training for the new season and their Technical director Leo Adra came out and confirmed that they were not letting him go on Tuesday. He scored 13 league goals last season for the Caterpillars and he was their best player in the 2015/16 big league triumph. On the same day Shaban was unveiled, another player Allan Katerega was also shown off to the media. Katerega was signed on a six months loan deal from Kenyan gaints AFC Leaopards early this week.